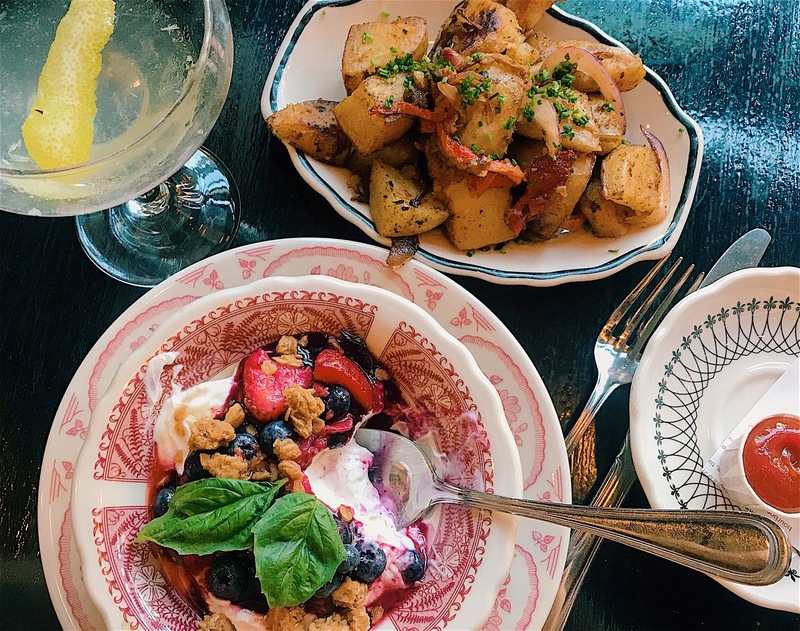 Living in a foodie city like Philadelphia can be a blessing and a curse. Blessing for the wonderful food, curse for my diet. This past weekend a couple girlfriends and I decided to hit up one of the places on our Brunch Bucket List – Bud & Marilyn’s. Located right at the corner of Locust and 13th St, Bud & Marilyn’s is an aesthetic dream. The interior design, the tables, the decor, the lighting can all be lumped into an art deco/Great Gatsby vibe. Moody dark corners mixed with a fun contemporary style bar make this restaurant scene a unique one for sure. We were seated pretty quickly and got our first glance at their amazing brunch menu. First thing first, drinks. I got the Green Gatsby martini ( very fitting name ) – which was a mix of gin, chartreuse, rosemary and lemon. It was refreshing, a bit strong but completely delish. We split the Warm Pecan Cinnamon Roll and it quite possibly could have been the best decision I have made in a long time. Oozing with cream cheese, pecans and warm cinnamon – one was really not enough for us. For my meal I went with their Yogurt Bowl and a side of Home Fries. Both were excellent, but to be totally real with you – next time I go back I am devoting my whole trip to that Cinnamon Roll. I suggest making a reservation before you head over as seating is limited and the waiting room is pretty small….but if you do not have a chance, it is worth the wait.